Following a proposal made by Tobia Bezzola, curator at the Kunsthaus in Zurich, the Foundation Henri Cartier-Bresson has decided to coproduce this ambitious project the significance of which lies not in the way the artists view each other but in the inherent nature of their two bodies of work. 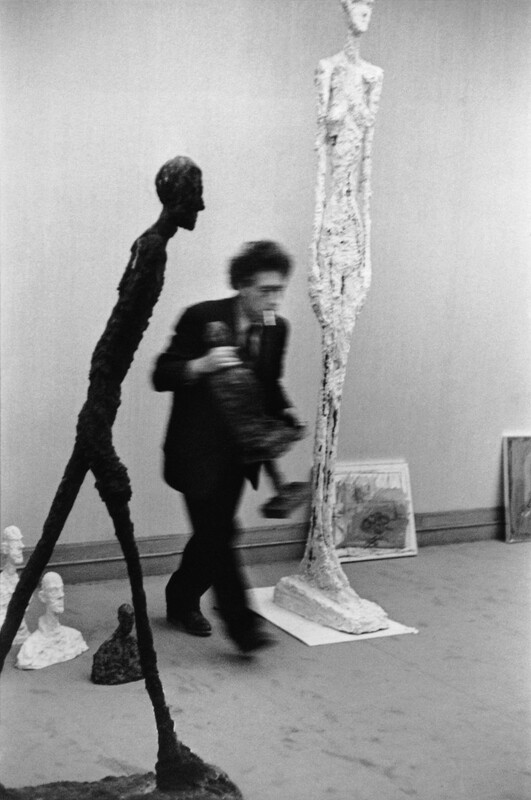 The idea is not to show Henri Cartier-Bresson’s photographs of Alberto Giacometti, the man, or of his work, but rather to bring into play two ways of seeing. Drawings by Giacometti of Sartre, Matisse, Stravinsky or Genet and photographic portraits by Cartier-Bresson of these same people are displayed together; one of Giacometti’s sculptures of Walking Man is juxtaposed with Cartier-Bresson’s Man Jumping (by the Gare Saint-Lazare); drawings from Giacometti’s Paris sans fin are intermingled with those by Cartier-Bresson, and lastly their self-portraits are made to converse with each other. Almost musical in its many resonances, it is an exhibition to which the friendship and mutual esteem of the two men lend cohesion. 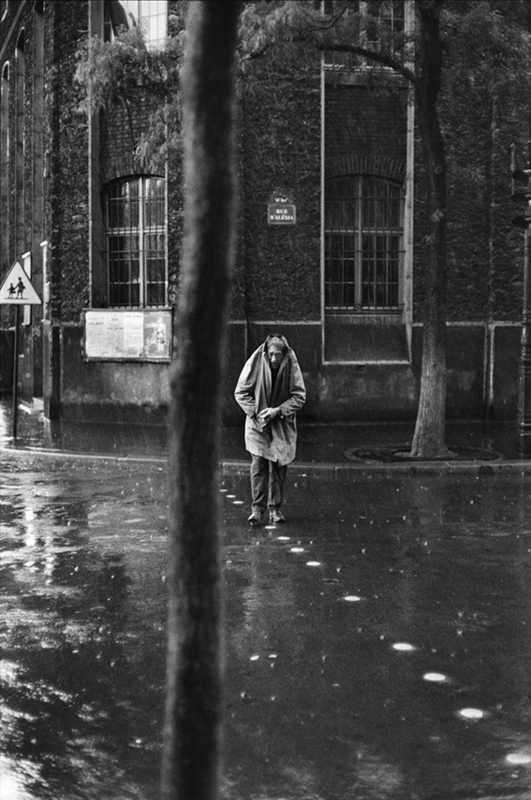 Giacometti and Cartier-Bresson in fact shared a similar approach to their art: they were alike in the way they perceived the world, alike in their inexhaustible curiosity about human beings. Viewing the selection of exhibits one is struck by the rhythmic setting of human beings in space, by the lightning transience of time, registered, paradoxically, as much in the sculptures as in the photographs. And if one studies the portraits, they emanate the same intensity as ever – “the interior silence of a willing victim”,3 as HCB put it – or else convey “the adventure, the great adventure, … of seeing something uncharted emerge each day from the same face, … the greatest of voyages around the world,”4 as Giacometti might have concluded. Their world, whether observed in a Montparnasse café or in a poor quarter of Mexico City, is thus revealed to us in all its mastery in this discerning impromptu duet. It was a concept that captivated Henri Cartier-Bresson so much. “It’s too great a tribute,” were his words when the project was put to him, “but I shall help you make the selection!” And that he did with characteristic glee. We are deeply indebted to the Kunsthaus in Zurich for coming up with this wonderful idea, to the Alberto Giacometti-Stiftung for diligently arranging all the loans, with the additional support of Pro Helvetia Arts Council of Switzerland. We should also like to thank the Foundation Maeght and the Foundation Alberto et Annette Giacometti as well as all the lenders for favouring us with their trust. This exhibition in Paris could not have been organized without the enthusiastic support of the CCF (HSBC Group), whose sponsorship marks the bank’s renewed commitment to photography and especially to Henri Cartier-Bresson. 1 Alberto Giacometti, Ecrits, Editions Hermann, 1990, p. 84. 2 Henri Cartier-Bresson, The Mind’s Eye, Aperture, 1999, p. 79. 4 Alberto Giacometti in conversation with André Parinaud in Ecrits, Editions Hermann, 1990, p. 279.